Some businesses seem to grow like crazy. Their customers are fanatical about them, and they happily devour most of their products/services. And month after month, year after year, they seem to be constantly growing and produce gushing streams of revenue. The truth is, there is no secret…but there are specific steps you can take towards injecting an explosion of growth into your business and fattening your wallet with wads of extra cash. But before diving into the specifics, let’s have a look at the basics of growing any business. The task of growing any business can be broken down into tweaking 3 simple things. Seem simple enough, doesn’t it? Well, this is how consultants double and even triple a business’s revenue within just a few months. It’s important to understand how these small tweaks can create a jaw dropping impact in any business. Let’s say the “ABC repair business” above is your business. You’ve learnt how to grow it after reading this post. As you can see, a 10% increase in the 3 fields boosts your revenue by a whopping 33%, landing you an extra $3310 in revenue. 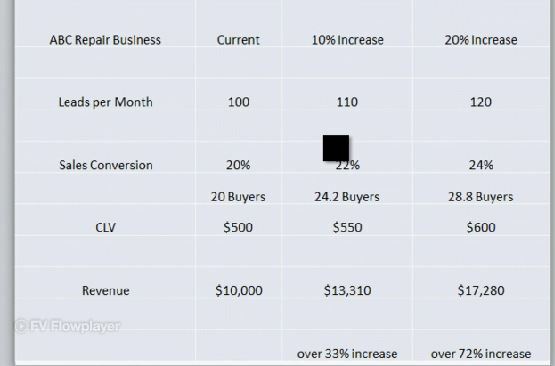 A 20% increase in each area (now we’re talking) explodes your revenue by a staggering 72%, and nets you a chunky $7000. All from three minor tweaks. Do you see the earth-shattering impact this can have on your business? Good, because it’s time to get started. The first step to boost your business growth is to increase leads, and one of the most effective ways to that is to guest blog. Despite reports of guest blogging being “dead”, it’s still a powerful strategy for boosting your business. It’s how Danny Iny became the famous Freddy Krueger of blogging, and grew his blog from a wimpy 30 visitors a day on a good day, to a thriving community of over 30,000 people who regularly buy his products and services. It was also used by Leo Woodrich, (co-founder of Buffer app) to explode his business. He leapfrogged from 0-100,000 users for the app in his first 9 months, just by guest blogging. So, you know that guest blogging is effective, but the question is…how can you use it to grow your business? Guest posting is no walk in the park, but it isn’t rocket science either. You can’t just expect to throw up a sloppy compilation of words strung together and expect to get killer results. You need to be consistent and have a system. Start by using sites like BloggerLinkUp. They’re a huge help when it comes to finding sites who are looking for content, and make a list of the sites you want to guest post on. Remember to target sites where your potential customers like to hang out. Write quality guest posts that help them get what they desire, and solve their pains and problems. Overtime, you’ll solidify your credibility, connect with other people in your niche and increase leads for your business. So what if your looking to increase your leads but guest posting isn’t for you, or maybe you’re looking to generate leads offline? Direct mail is another powerful lead generating tool. Ash Ambirge, (founder of the Middle Finger Project) had some shocking results with this. When Ash was having a tough time converting high quality clients into customers, she took an unusually creative approach. She stormed over to a roofing supply company and scooped up 30 roofing shingles. The results of this creatively crazy endeavour? Ash received a response rate of over 90% and secured deals with almost all of her leads. You can use the same out-of-the-box thinking to ramp up leads for your business too. Imagine if one day you receive a physical letter mailed to your address. It has a fake blood sachet stapled to the corner, and it starts of by talking about the attachment, and how your business could be bleeding money. The letter then transitions into a sales message about how the consultant who wrote it can help your bleeding business recover. Now, compare that to receiving another “pitchy” email offering to help grow your business. Who are you likely to pay attention to and do business with? The email will probably be marked as junk, along with oceans of other of “salesy” emails you receive, whereas the sales letter catches your eye. You’ll at least give it a read. Sending out physical mail catapults you above the noise. It makes you stand out amongst the hordes of other businesses who bombard their prospects with email. Gather a list of prospects you want to do business with. You can purchase them online or you could compile one yourself (time consuming, but a thousand times more effective). After you have your list sorted, think of a way to catch your prospects attention that no one has done before. Can you staple a small attachment to your letter? Or mail a mini treasure chest to your prospects with your letter inside? It doesn’t have to be fancy, just odd and creative enough to hook your prospects attention and reel him in. The next step to skyrocketing your business growth is to boost your conversions; which simply means to increase the amount of people who buy from you. And one of the best ways to increase your conversions is to use stories and emotions to hook your prospects and seduce them into desiring your product/service. Neuro-imagery revealed that consumers base their buying decisions primarily on personal feelings and experiences rather than the features, facts and attributes of a brand. The emotional response to an ad is far more influential on a consumer’s intent to buy than the actual content of the ad in itself. The more likeable an ad is, the more chance that it will increase a brand’s sales. And what better way to arouse emotions in your prospects than to use stories? That’s what journalist Rob Walker did. Rob wanted to test the emotional power that stories have on our perceived value of products. $128 worth of unwanted thrift store items sold for a whopping $3,612.51. A value increase of over 2,700%. Yes, he used stories and emotions used to sell junk at insane prices. If stories and emotions could create a value increase of over 2,700% for junk items, imagine what they could do for your business. Now you’re probably thinking “that’s great, but I don’t have anything to tell my customers”. Take time out to think about your business. What challenges and hardships did you face when starting? Did you have to make some crazy sacrifices? Did you experience any failures that knocked you down? Or any shocking successes that made you leap for joy? Keep digging and you’re likely to find a single event or series of events that you can weave into powerful stories that boil your reader’s emotional cauldron and skyrocket your conversions. When it comes to marketing and boosting conversions, the pen can be an extremely powerful tool. Just take a look at some of the case studies below that showcase how tiny tweaks to your copy (sometimes just one word) can lead to shocking spikes in conversion rates. Content evangalist Michael Aagaard of contentverve.com is well known for testing the heck out of everything copy related. However one of his most impressive case studies is when he was approached by bettingexpert dot com to increase their email sign ups. First he changed the headline from “Join betting expert” to “Get Free Betting tips”. He then changed the call to action from “Sign up” to “Sign up and get the best daily tips”. Resulting in a conversion rate boost of over 31%, with two simple tweaks. Another testament to the power of tweaking your copy is freelance writer Bamidele Onibalusi. He changed the headline of his hire me page from “Hire me” to “Let Me Help You Get Results by Writing Quality Content and Guest Posts for You.” Seems simple doesn’t it? But this “simple” change resulted in a 200% boost in conversions. It’s amazing how small tweaks can create such a tidal wave of impact, but it makes sense when you think about the reason why these changes were so effective. They produced amazing results because they blossomed from vague, selfish statements, to benefit driven copy that clamps down on the readers desires and needs. Take a look at a place on your website where you call your customer to action. If it seems a little vague and self centred, switch it up to something benefit driven, like the examples above. Think about the pain or problem you’re solving and what your customers are after the most, then proceed from there. Making your copy benefit oriented is just one way to increase its power, for more tips on supercharging your copy for maximum impact check out this post. The final step towards blasting your businesses growth is to boost your profit from each sale or increase your client lifetime value. There’s a ton of ways to increase your client lifetime value, but one of the easiest and most rewarding ways is to simply increase your customer retention and wow your prospects into loyalty by exceeding their expectations. A study by Harvard Business School showed that a small 5% increase in customer retention can give a 95% increase in profits! And the best way to boost your customer retention, is to focus on providing a service that exceeds your customer’s wildest expectations. An experience saturated with so much magnitude that they can’t help but talk, tweet, share, and sometimes (if you really did your homework)…blog about it. The best thing is, you don’t have to do something huge to wow your customers. It can be as simple as having better customer service than your competition. So many businesses treat their customers like annoying accessories instead of important people. They take forever to respond to emails, have a long wait time to answer by phone and have dull robotic staff members that lack sympathy. It means that just by enforcing a friendly customer service attitude, you launch yourself above the hordes of cold businesses that treat customers like cash cows instead of human beings, and are more likely to keep your customers, and as a results, increase your profits. So there you are, you now have 5 pack-a-punch ways to grow your business. Your next is to simply pick one aspect of your business, and work on improving it. What problems are you having with growing your business? Let’s see if we can help you out in the comments below!